Herbal cough and cold care ranges from off the shelf products like Traditional Medicinals Gypsy Cold Care to a mix of homemade recipes tailored to your specific symptoms. 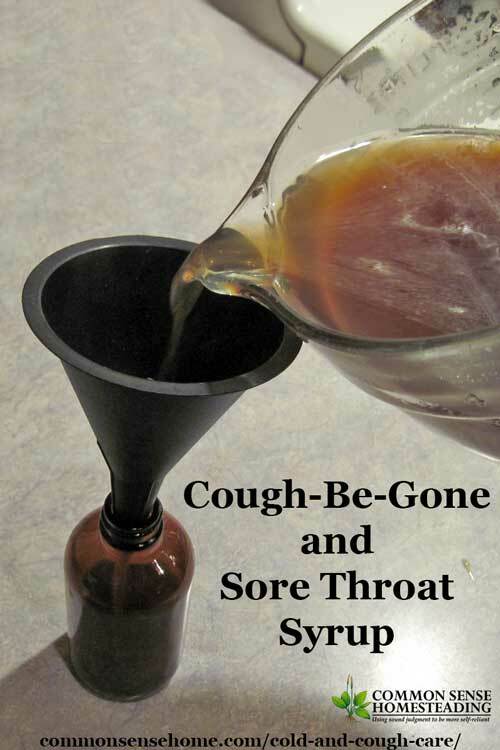 The sore throat syrup has a mild licorice taste that is quite palatable. I think even kids would take it without a fuss. 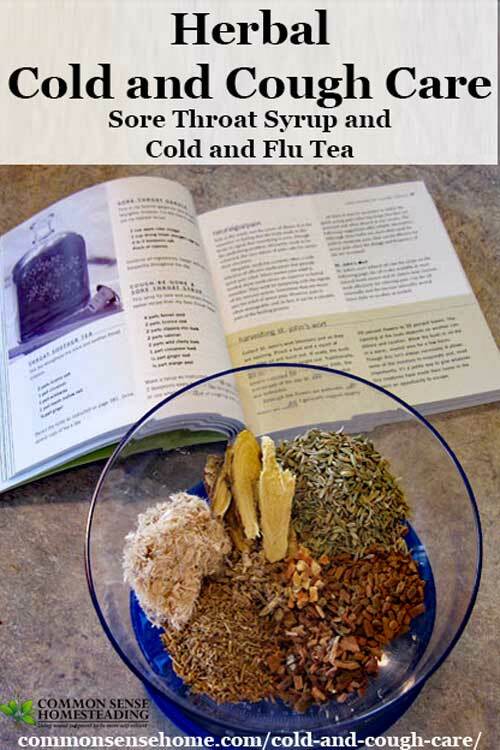 The cold and flu herbal tea recipe below has more of a kick. To make 1 quart of herbal infusion, Rosemary recommend 2 ounces of herb mixture to one quart of water. To get roughly the right weight, I used 2 tablespoons fennel seed, 1 tbsp licorice root, 1 tbsp, slippery elm bark, 1 tbsp valerian, 1 tbsp wild cherry bark, 1 1/2 teaspoons cinnamon bark, 3/4 teaspoon ginger root and 1/4 teaspoon orange peel. All measurements were a little generous so I had enough to get 2 ounces. Over low heat in a heavy bottom pot, simmer the herbs and water until it is reduced by half, so that you have one pint of liquid. Strain the herbs out of the liquid, rinse chunks out of the pot, return the liquid to the pot. For each pint of liquid, add one cup of honey. You may go up to a one to one ratio for a sweeter syrup (1 pint honey to 1 pint liquid). Heat gently and mix until the syrup is well blended. Add a small amount of brandy, if desired, to help preserve the syrup and act as a relaxant. Rosemary suggests taking 1 to 2 teaspoons every hour or two throughout the day, or as needed for cough. Place herbs in mug and cover with boiling water (leave enough room for your lemon juice). Cover and steep for 5 to 10 minutes. Strain herbs, mix in lemon juice and sip slowly. The warmth and natural antihistamine action of the herbs is great for congestion and runny noses. You can adjust the amount of the herbs a bit to taste. I was a little generous with the cayenne in the photo above – too hot for me! *Note: I had originally listed larger portions of the herbs, but with the dried herbs, I think these amounts will probably be better for most people. You can use more to taste. I am just now accumulating my herbs for cold and flu, only a week late. Had the flu last week :(. I WILL be prepared next time. Great recipes! Would love to win this! I have bookmarked this for easy access, cols season is approaching. I would really like to see some ideas on pain relieving things. I have arthritis, work in retail (read: on my feet a lot), and my wife has fibromyalgia. Anything to help these would be AWESOME! Yes, there are several methods for treating pain naturally. But I don’t have the knowledge those at Mountain Rose have. Since this post was written, there have been a number of posts added to the Home Remedies series, including Home Remedies for Sore Muscles and Home Remedies for Arthritis. Something for recurring pneumonia and bronchitis! i have lupus and fibro so I say pain relief! I would like to learn more about comfrey and remedies that can be obtained through it’s uses. Thanks ! I’d love to know more about allergy (stuffy nose) remedies, pain remedies for neck and back issues and also, would love remedies for toddlers who have issues falling to sleep, some sort of calming remedies?? Will have to work on the toddlers remedies in the future, but a dream pillow (mesh bag filled with herbs, or herbs stitched into a bag so your toddler won’t open it and make a mess) might be an open. Chamomile:Calming, relaxing, and said to keep bad dreams away. I would like to learn more about elderberry syrups and what they are good for and if there are other ways to use them. Something for chronic lower back pain, please. I am just getting started and could really use some help! Id like to learn more about using herbs as foods like elixirs, to nourish and heal. Did you have a post about allergies yet? Always trying something or other here! Thanks for these ‘receipts’. Now it looks like I’ve got lots of ideas for more things to try! I would love to see a herbal remedy that would help someone suffering from GERDS and for a chronic sinus infection. I love this cough remedy!! I would love to learn of something palatable for pain. I have a crampbark tincture I use regularly, but I have fibromyalgia, arthritis, corporal tunnel and migraines. When I have a bad flare up I can be down for a few days at a time. I really enjoy your posts, and all the information. Love love love herbal healing! I would like to learn more about allergies, so far what has worked the best is a clay water cure during my hay fever sneezing, but I wonder if anything else would help ease symptoms as well? I have found that improving my overall diet and health has helped with my allergies, not knocked them out completely, but helped! Love Commonsense Homesteading and Love Mountain Rose Herbs!!! I have found a super simple way to help coughs, colds, and stuffy heads: mullein leaf tea. I buy it in bulk when it is available, have used commercially available tea bags, and even learned what it looks like and foraged for some of the common mullein that grows everywhere here. Just breathing in the steam from a hot cup of mullein tea starts the sinuses clearing, and because it has expectorant properties, it will get everything flowing quickly. Mountain Rose Herbs stocks Mullein oil, flowers, leaf and seeds, for those who would like to give this a try who don’t have the opportunity to forage. For those who have the opportunity to go wildcrafting, you can find photos to ID mullein here – https://commonsensehome.com/weekly-weeder-13-common-mullein/ (as well as more information about its properties). How about something for joint pain. both these recipes sound like something I can do! I like the idea that I can make such remedies at home, and know what’s in them. I have been wanting to make my own remedies for a while, Would love to givive this a try! I LOVE mountain rose herbs!! I will be making more elderberry syrup soon! All herbal remedies are really interesting and are ones I want to be aware of – but coming into winter, I’m especially wanting to know about seasonal health issues and remedies. I’m new to herbal remedies, so anything would be great! Would love to learn more about this! Oh gracious, what herbal remedies would I NOT like to know about? 😀 I think sore muscles and arthritis helps for my hubby would be great, and like others have said, seasonal health and wellness. Anything for the flu? All of them. I’ve been a gardener for years, but have only dipped my toes into the pool of wisdom that is herbs. I dream of a home apothecary. Getting recipes to try – one or two at a time- makes me feel less overwhelmed by the vastness of it all. I have made a few of my own herbal tinctures and syrups. I love the idea of having a good general immune boosting remedy that my kids will willingly take! I’d love to learn more about remedies from plants relative to my geographical location! Have you checked out the Weekly Weeder series? Would love to learn more about cold remedies…I see that you have been listing some links in reply to other comments so I will be checking those out! I would like to learn more about making my own liquid vitamins. I love herbal remedies. They work great! I would like to learn more about natural sleep aids. I would love to make either of these for use this winter, but especially the herbal syrup. I would also be interested in herbal preparations for arthritis. Thanks for the giveaway! the remedies especially suited for kiddos. Those are the ones I’m always looking for! I would love to learn more about herbal remedies for “that time of the month” and herbal remedies for improved concentration and remedies for relaxation. I’d like to learn more about natural remedies for all the basics like colds, sore throat, coughs, cuts/scrapes, bug bites, etc. What a wonderful recipe. I love Rosemary Gladstar. I’ve been reading her books for a long time. Thanks for these recipes and the chance to win! I love to learn about all the herbs you are sharing about! Wonderful! I guess if I had to pick one thing right now, maybe something that would continue to boost our immune system through the winter months. Thanks! Would love to win this! I haven’t ordered from Mountain Rose Herbs yet but am getting ready to place an order for supplies for the fall/winter. Thanks! Don’t forget to watch for monthly specials. I list a few on the sidebar, but if you visit their site they have a whole page of listings. In October, soothing herbal bath salts are on sale, too. I LOVE THIS BLOG! So many great recipes and articles! Thank you! I’m so thankful that more and more people are interested in herbal healing for common ailments instead of running to the pharmacy. Thanks for these informative posts on spices and herbs. I’d love to read more about pain relief and anti-inflammatory tinctures and syrups. How about herbal care for hair. I have fine oily hair. I’d love to learn more about herbal remedies for sinus congestion. I am allergic to epinephrine. which is in every cold medication it seems. I would love to learn more about remedies and treatments for common dog problems! (fleas, thyroid etc. etc.) Thanks for the opportunity to win! I’m interested in illness/allergy remedies! 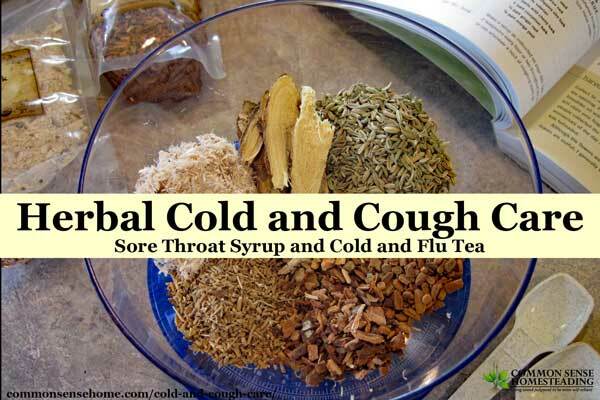 Trying to accumulate natural remedies for cold/flu season as well as other ailments! Thanks for the recipes! This is great, would love to win! I also have lupus so I would love to see something on pain relief for joints although I use Tiger balm now which does help sometimes. I would also love to see something for winter dry skin, I get itchy patches with the onset of the cold weather so a good lotion of some type would be wonderful. Really either of these items with a warming effect is awesome in the winter. I use to buy this oil and lotion combo that warmed when you used it and had the most amazing pine/foresty scent. The company went out of business and I have never found anything to replace it. That set was my after bath oil and daily moisturizer for the entire winter and I sure do miss it. Thanks for asking what we would like to see posted! I haven’t experimented with warming agents yet, but will keep that in mind. I would really love to learn more about herbal remedies to treat my animals. such as ringworm, ear mites, a natural heartworm formula, hotspots, snake bites, wound care. We were just looking up natural remedies last night to see what we needed to make our own. Thanks for a great giveaway! I usually make fire cider- I still need to make some this fall but you steep together apple cider vinegar, cayenne pepper, ginger, horseradish, garlic and onion for three weeks and then strain out the liquid, throw away the solids and use the liquid a teaspoon or two at a time mixed with honey. It gets rid of colds and flu really well, especially congestion. Yowsa! I imagine that would clear *everything*! There is already so many people coming down with colds, flus, and coughs. I would love to win this! I’m always looking for a more natural remedy . My kids think I’m odd, but I’m slowly converting them. Is there any type of herbal relief for someone with bad psoriasis? My husband has suffered for decades with it and I’d love to help him heal! I’d love some ideas on herbs for fertility/conception! this would be a very nice item at this time of year. Thanks for the chance! I would like to know more how to best care for scrapes cuts and that kind of wound. What keeps it cleanest and what helps seal it and finally what helps keep scarring to a minimum. Thanks! I would like to know more about herbal remedies for ezcema in children, colds and flu, weight loss, hair loss, seasonal allergies, sinus infections, ear infections….. I have decided to toatally get away from all bad chemicals and I am always seeking alternate ways to take care of my family. Thanks so much for this great offer!! I would like to know more about pain remedies for little ones. My 5 and 3 year old boys are getting lots of bumps and bruises and I want to help them when they feel pain! I’d like to learn about natural/herbal care for allergies! I’d like to know about herbs that can help heal nerve damage–if there are any. I need to learn more about thyroid support. I love Rose Mountain! I have received only fantastic quality from them. It would be great to win the cough syrup ingredients as we head into the germ-iest time of the year! We are both pediatric nurses, so our family ends up exposed to all kinds of cooties! 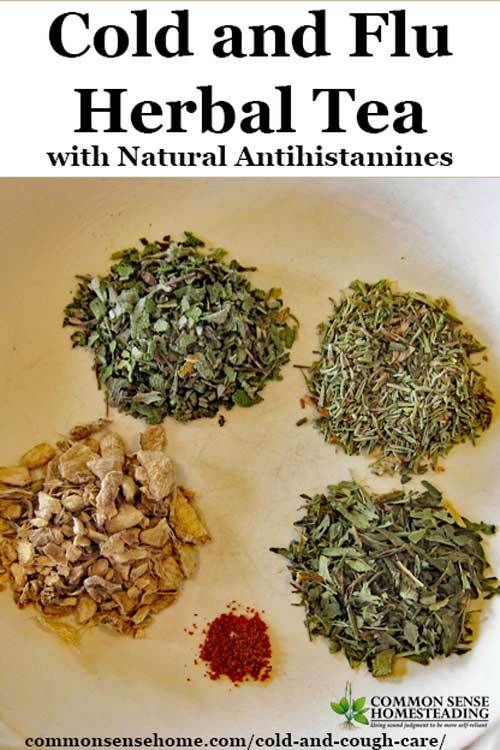 Thanks for the great blog; we love your herbal info. I would like to learn about all of them! I am currently an herbalism student (working toward my certification slowly but surely) and my current focus is on herbs that help repair the gut, as my children suffer from celiac and I am looking for ways to help them heal. Thanks for having this giveaway! I would LOVE to learn more about how to use common “spices” as healing herbs. I love that the cold and flu recipe was mostly stuff I’d already have and not need to order. More of that. I’m just beginning to learn more about medicinal herbs and would love to win this! I would love to win this — I love Mountain Rose. Something to help me go to sleep and sleep better! I’d like to learn more about energizing and sore throat help herbs! I love Mountain Rose Herbs products. Great quality and good prices. I love learning about about how to use common herbs and spices for healing common childhood illnesses as well as herbs for tonics and building immunity. I really like Mountain Rose’s products! Thanks for the giveaway! I would like to know more about natural remedies for diabetes. Every member of my husband’s family has to use insulin as well as other medicines. 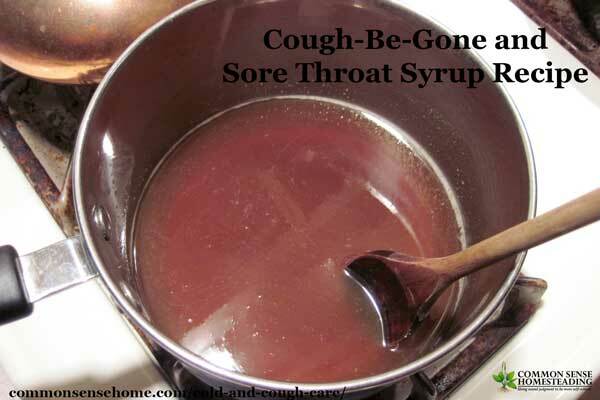 Cough be gone sounds tasty. Between allergies and colds we have here- I plan on trying it. Thanks for sharing. I’ll have to try this syrup. I usually make an Elderberry or Wild Cherry syrup for the winter. Information about allergies would be great. Mountain Rose Herb is a great company. I’m trying to build up my collection of herbs I haven’t grown so I’d be thrilled to win either one! Thanks for posting all the info that you do, I love it. Can I ask if a tulsi tea from Dr. Mercola is an organic one too? Can you confirm if it is good? Here it is http://organicindia.mercola.com/tulsi-tea.aspx because I’m thinking of trying one of this because somebody told me that it has a strong antioxidant properties too. Organic India teas are indeed organic – and tasty. Another option is to buy bulk tulsi and make your own blends, or grow your own. MHR has bulk tulsi, tulsi capsules, hydrosols, oil, and seeds. How do you learn to grow and forage for herbs anywhere? Thank you from N. Kentucky. For foraging, you might want to check out the Weekly Weeder series – https://commonsensehome.com/wildcraftingweekly-weeder/ I normally get a new post up on Wednesdays, but sometimes it ends up on Thursday. Will be wrapping up for this season soon as we are due for hard frost, but will be back next year. I would like to learn about immune enhancing herbs and herbs that help digestion. My 4 year old had cancer when he was 6months old so we really try to use natural remedies, he always seems to get everything that goes around so pediatric immune enhancing herbs would be me largest interest. I would like a sore throat remedy. Perfect timing! A few friends and I are getting ready to order herbs together from Mountain Rose Herbs in order to prep for winter. This is such a generous giveaway! Whether I win or not, the Cough-be-Gone syrup and Cold & Flu Tea are going on my to-make list! Oh, I almost forgot ~ I’d love to learn about long-term remedies that could help with symptoms for autoimmune disorders, if any exist. Nice giveaway. I need to increase my natural remedies supplies and these Mountain Rose herbs would be a great start. Thanks for the opportunity. I would love to learn more about remedies for allergies, as well as remedies for common toddler/child ailments. I enjoy making my own first aid kit and I love Mountain Rose Herbs!! Herbs are like second nature to me but I’d like to delve into learning more about identifying them in the wild. Thanks for the giveaway. I’d like to learn more about making teas for health. Maybe something to help relax at the end of the day (maybe even something breast feeding mamas can drink). Mullein is not on here. It is a wonderful herb for colds and cough. I an so new to herbal remedies I don’t know which I would like to learn more about except all. Maybe headaches, sinus infections, inflammation, seasonal allergies. Those are regular issues in my family it seems. Headaches, sore throat, muscle aches. Love to learn as much about herbal remedies as possible! Thanks for the giveaway opportunity as well! Pain relief and first aid. I’m so excited I found this site since I just hear someone cough and it seems like I am ill too. I can’t wait to make the syrup and tea! I would like to learn about herbal remedies for arthritis. I have just learned of Mountain Rose Herbs and am excited to try making my own health care items. I loved Mt Rose Herbs! They’re my go to place for anything herbal. One thing I’d love to have more of is info on herbal digestive help.